6 photographic prints : b&w; ; 5 x 7 in. Published in Rafu Shimpo, August 16, 1951, Japanese section. Mr. Shinichi Kudo, editor of Japanese newspaper Mainichi and former employee of Rafu Shimpo prior to World War II, arrives at Los Angeles International Airport (LAX) and attends a party at San Kwo Low restaurant in Little Tokyo, Los Angeles, California, August 15, 1951. Includes various images of graying, mustached Kudo in white suit at LAX and in shirtsleeves and bow tie at party. 1P: Kudo stands on ramp stairs waving as he arrives at LAX. Later became president of Tokyo Mainichi Shinbun. 2P: Kudo, right, with Frank Kumagai, actor, at San Kwo Low. 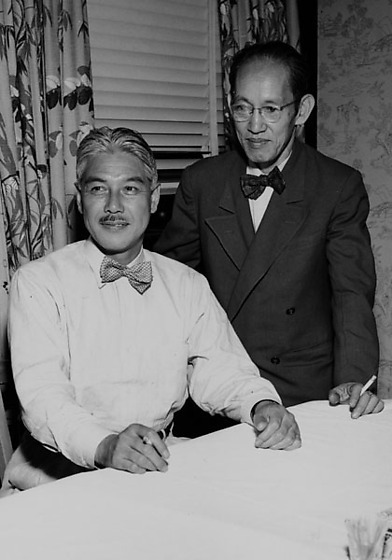 3P: Kudo, seated, with Toyo Miyatake, standing in suit, bow tie and eyeglasses at San Kwo Low. Miyatake has a cigarette in his proper left hand. 5P: Kudo stands with wife behind, Mrs. Miyake, sister-in-law, a boy and a man seated in front row at San Kwo Low. 6P: Welcome party at San Kow Low. Front, left to right: Frank Kumagai, Kudo, Teiho Hashida (Rafu Shimpo editor), Fujimoto (of Tokyo Mainichi), Kazuo Yano. Back, left to right: Toyo Miyatake, Jiro Tani, George Nozawa, Ochi and Tambara. Typed on original envelope: Mr. Kudo Mainichi -- Airport & Party at Sankowlow. Kudo had been in California for San Francisco treaty and stopped in Los Angeles afterwards.